shares Patu, beaming with pride. Patu, 39 years old, has been married to Kewal for twelve years. All was not well in their marriage of twelve years though. Kewal had been an alcoholic for many years of their marriage. In fact just uptil two years ago, he had been an irresponsible husband and father and often physically abused Patu in his drunken state. Kewal worked as a carpenter through which he earned a menial income of PKR 250 per day. added Kewal laughing. Before this women economic empowerment, supported by YCARE and UKAID, came to Kharoro Charan of Umerkot in Sindh, forty-year-old Kewal acted imprudently and wasted many hours of the day doing nothing. I used to drink in the morning, afternoon and at night. I never dreamt about a better life, education, health or of any other facilities for my children. I never thought about the future. In May of 2016, Community World Service Asia, the implementing organization for the project, identified Kharoro Charan village as part of their livelihoods’ interventions in Sindh, Pakistan. To ensure community participation at every step of the project, a Steering Committee consisting of members of the village, was set up. In one of the committee’s initial meetings, as the members were identifying possible participants of the various components of the project, they unanimously nominated Kewal to participate in a training on gender activism. Kewal initially refused to attend the training but some of his neighbors and elderly community members convinced him to give it a try and join the training. The training completely changed my life. The facilitator of the training was a professional and was very experienced. He explained the topics very effectively. Kewal started feeling a passion and commitment to bring change. He felt like a changed man after the training. I participated in all sessions actively. During the two days of the training, I was occupied for the entire day, meaning I was not able to drink for more than eight hours. The sessions in the training were so interesting that I did not even feel the need to drink alcohol. Topics including gender discrimination, domestic violence, early childhood marriage and education were all very important and shared with us in an interesting manner. I never knew how badly domestic violence affected families, especially the little minds that get tangled in the violent environment. After taking the training, Kewal started practicing what he had learnt. Not only had he learnt to fight his alcoholism but also to fight for the rights of those whose voices were suppressed. Patu found a different husband in Kewal after the training. Patu and I attended the steering committee meetings together. We contributed to the decisions made on village matters. I took Patu with me in the gender sessions and meetings, as together we were stronger. Our shared efforts in bringing change in other’s lives were more effective and productive. I was given five households to work with as a gender activist. Bhaga, my sister-in-law’s household was among them. I held meetings with the family and discouraged Bhaga’s husband, my brother, to drink excessively. He used to physically abuse Bhaga and also beat his four children. Today, he rarely drinks and Bhaga works and earns a good income as an artisan and tailor in the village. The feeling of bringing happiness and a better living to someone is the best feeling in life. Koshaliya, a fifteen-year-old niece of Kewal, was getting married in the village. The preparations for her marriage were underway and the wedding invitations were sent as well. 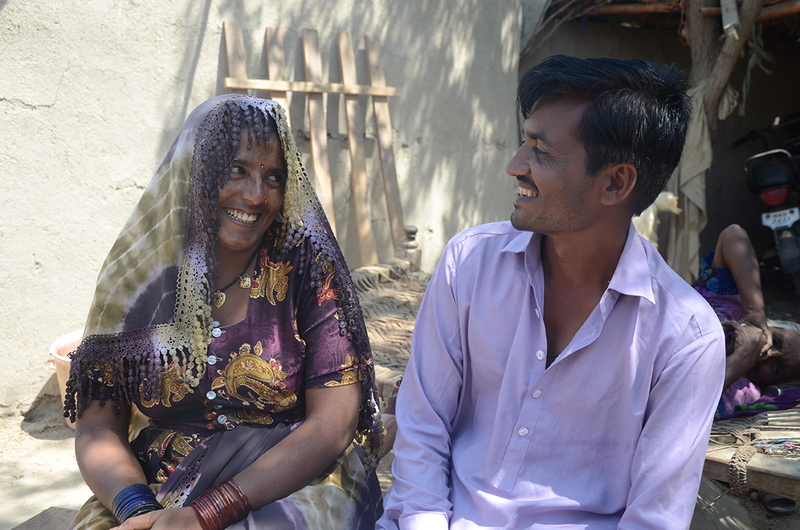 Kewal, now a transformed man, did not agree with the idea of marrying such a young girl. I called off the wedding after learning the disadvantages of childhood marriage. Her in-laws to be were furious and spoke very badly of me. They came to our home, accompanied by some villagers and quarreled with us as well. I calmly explained to the family that Koshaliya was very young and putting the burden of marriage on her at such a young age would adversely affects her mental and physical health in many ways. We met with the in-laws to be a few times more before I could fully convince them on the decision being right. The wedding was postponed to take place after two years. Kewal said that women in Kharoro Charan were never taken into consideration during decision-making processes.